At one time, lighthouses led the way to safety, or at least warned sailors they were approaching danger. When I wanted to come up with a photographic representation of the Here Comes Later concept, a lighthouse seemed to serve the purpose well. My blog and my consulting work are designed to lead people to safety, or at least warn them of potential dangers in the world of public relations, media relations and social media. And what better way to show that there is no stopping later as it approaches than to use a testament to a bygone era? By the way, this is a picture I took of Little Sable Point Lighthouse, on the shore of Lake Michigan, about halfway between Ludington and Muskegon, Michigan. 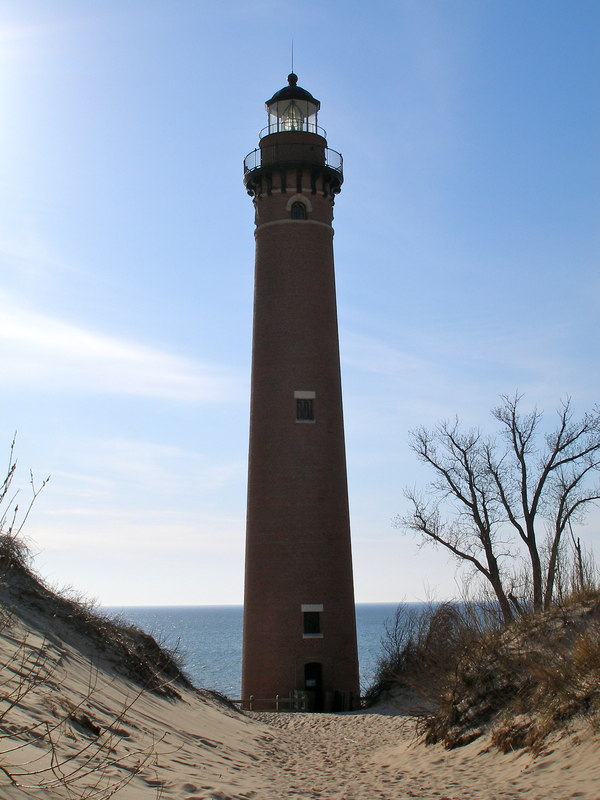 Activated in 1874, the Little Sable Point Lighthouse originally consisted of a 107-foot tower attached to a brick dwelling. The brick dwelling was razed in 1955. In 1977, a white paint coating was sandblasted from the tower, exposing the brick’s natural color. A third-order Fresnel lens remains in the tower.